The rains will come soon but the farmers will end up in a similar situation like today, unless they have a way to store the run-off water from the rains! Horti is a small village that none of us has heard of and is located close to the better-known town of LATUR, in the drought stricken Marathwada region of Maharashtra. Thanks to the depleted ground water levels, poor rainfalls over time & inadequate managemnt of water resources, the farmers at Horti are fighting a never-ending battle every year with despite the usual monsoon rainfall. The rains will come soon but the farmers will end up in a similar situation like today, unless they have a way to store the run-off water from the rains! Enter Suryoday Parivar a NGO located in Indore, which has started building unique canals for farmers that allows them to trap rainwater, run offs & leverage this reservoir of water to both water their fields & replenish their ground water tables. In their latest initiative in HORTI, they plan to build an 8 km long canal that runs through & along the fields of the 700 odd farmers & which, hold your breath they plan to complete in just 15 days! The other benefit of all this digging and excavation is the soil that is pulled out is used as topsoil by farmers in their fields & improves yields. 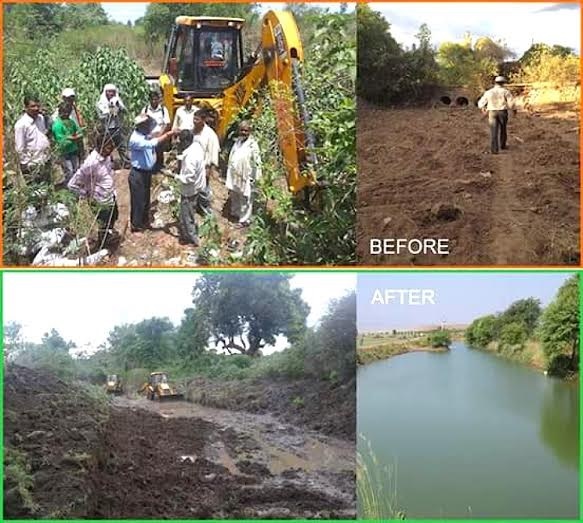 This initiative is the brainchild and is spearheaded by Bhaiyyu Maharaj. The cost of this 8 km canal is INR 6 Lakhs. The 700 farmer families are contributing 50% of the same. Suryoday Parivar is leveraging technology & crowdfunding in order to raise the balance INR 3 Lakhs. The campaign is also available in Hindi to reach a larger audience fueladream.com/home/campaign/216/hindi. This could be a precursor to more such initiatives that allow the general population to start impacting rural India & allows NGOs to impact farmers in a manner never envisaged before. These canals are about 10 feet deep & 16 feet wide & are built to store water in such a way that farmers who have fields on either side of this canal can draw water from them. PLUS the soil dredged to make the canal is used to fertile soil in the fields & greatly enhances yield.